It’s said no man is an island. But writer Parish Adams is out to prove them wrong. Broken and unable to bear the violent death of his child, he’s isolated himself on a private beach in Maine. He finds no comfort in the warmth of relationships. For Parish, the cold Atlantic Ocean is company enough. Scarlett Lyon’s life has taken a dramatic turn. Single and independent, living in Montana, nothing was tying her down. Then her sister’s fatal accident changes everything. She finds herself guardian for her nephew Sam. Now she must relocate to Martin’s Beach. And more jarring than that, become a mother figure. Three wounded hearts. Two passionate souls. One tempestuous Beach In Winter. How can I express all the feeling this book is giving me on words? This book is more than beatiful and soul wrenching. Three broken souls who find their way to love and help each other to heal, not forget, to heal their broken hearts. Parish , this man who had his heart beyond broken , who think nothing can help him to heal, find this two beatiful but sad souls, Sam and Scarllett. For me this is the most beatiful work from Leslie Pike, this book is so well writting, the details, this book makes you feel all the details, the sea, the sand , the angry waves, everthing, you can feel the pain, to much pain, right now I'm criying , feeling their sorrow, , is this kind of book who broke your heart and at the end mend it. Like always Leslie give us a beatiful family on the background, a beatiful dog whohad his heart broken too for the loss but find this incredible souls to help him to heal too. My poor English can't express well how I feel for this incredible book, I love it, this book is beyond amaizing. Thank you Leslie for give us this beatiful book. A little point: for me , that seagulls who always wake up Parish? For me is Justin , his son, who always was there to take care of his Dad , his soul leaves whe he can see Parish was better and have a beatiful family at his side. The Beach In Winter is a phenomenal story of grief, mourning and healing. Neighbors Parrish, Scarlett and her teenage nephew Sam are all grieving incredible losses when their paths cross in a small Maine beach town one fall. Over the course of that winter, all of their lives are forever changed as they strike up tentative friendships that become everlasting bonds. Parrish is drowning in his grief five years after his son’s brutal death. A total recluse, he spends his days drinking and smoking when he’s not writing his detective series. He doesn’t even know that his next-door neighbors have died until a forced interaction with their son’s aunt, who is now Sam’s guardian. Little by little, Scarlett and Sam being Parrish out of the black hole he’s been existing in. And along they way, he helps her navigate parenthood and helps Sam grieve his parents. There are so many sweet moments between Sam and Parrish. He expertly walks the fine line of being a friend and mentor with the young boy. And Sam brings out the paternal feelings in Parrish that he long ago buried. The romance between Parrish and Scarlett is equally sweet. It develops organically from a mutual attraction to something so much deeper. On that beach one winter, three lost souls come together, healing one another, showing one another a way out of the darkened, and letting each other know that it’s okay to sometimes just talk to the waves when you don’t want to talk to people. The waves always listen. 5.0 out of 5 starsEmotional and captivating story! Loved it! I have been reading Leslie Pike for a while now and love her work and yet she still manages to surprise me. She blew me away with The Beach in Winter. This story was emotional and heartbreaking and completely captivated me. The characters and their story will consume you and stay with you long after you finish. Parish Adams wants to hide from the world after facing an unimaginable tragedy. He is lost and broken. Scarlett Lyon just lost her sister and her husband. She is heartbroken and devastated and yet she now has to raise her nephew, Sam. Three damaged people who find each other when they needed it most. They form a friendship and bond that may just begin the healing process. 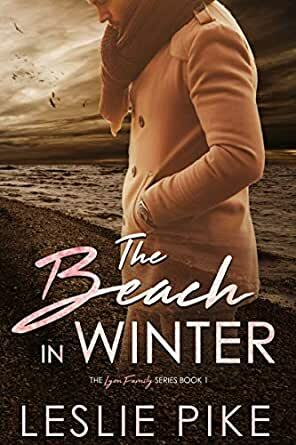 The Beach in Winter by Leslie Pike was a great surprise. Leslie was able to show us her versatility as a writer in this stunningly moving story about loss, grief, tragedy and second chances. This is a must read! I could not get enough of this story and found that I would read it whenever I had the chance. Even if it was eating dinner or jogging on the treadmill, I did not put my kindle down because I needed to know what was going to happen in the story. This was an incredible beautiful and heartbreaking story that really explored the grief that individuals experience while finding comfort with each other. The writer did an incredible job with this story as it really resonated with me. The emotions really flowed through the words throughout the story creating an emotional read. Scarlett was an incredible strong character that experienced a great lost but it showed how strong she was when she took on the responsibility of her nephew. I really loved the way that she was there for Parish and didn't push Parish when things got too hard for him. I found that was incredible caring and patient in regards to her nephew despite being thrown into uncharted territory. The Beach in Winter will have you going through so many Kleenex. Scarlett never seen the drastic change of her life coming. She’s lost her sister and brother in law, and now has to take care of her nephew. Parish has never gotten over the lose of his son. And for him cutting out the world is what he does to just get through life. Leslie Pike touches your heart and soul with this amazing book. You’ll cry, laugh, and find hope with this book. I fell in love how they were friends first just trying to help each other, but as time goes on feelings develop into way more. Disclaimer please make sure you have Kleenex for this book.